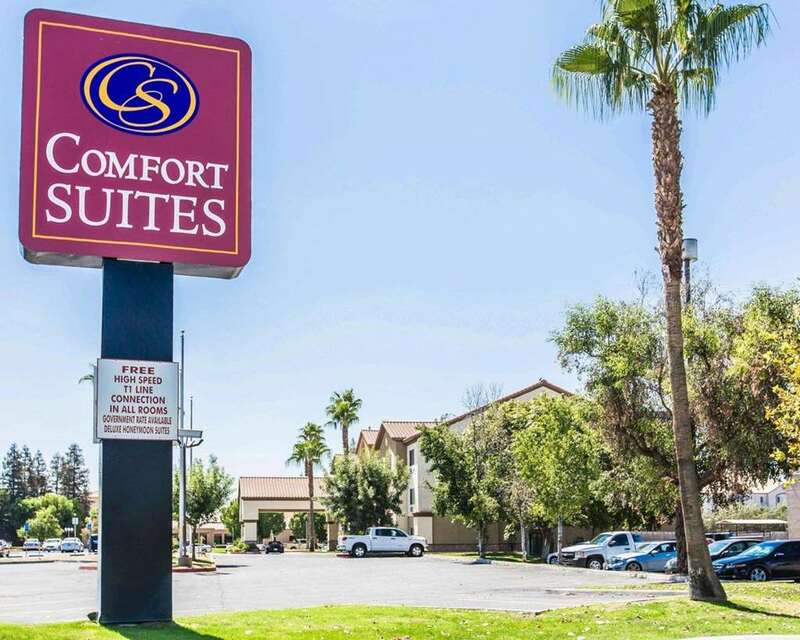 Get everything you need to stay on your game and be at your best at our Comfort Suites hotel in Bakersfield, CA. Our smoke-free hotel is close to several local destinations, including Cal State University of Bakersfield, Links at RiverLakes Ranch, Buttonwillow Raceway Park, Kern River and Famoso Raceway. Take advantage of our hotels free WiFi, outdoor pool, exercise room, free weekday newspaper and laundry facility. Unwind in your spacious suite, all of which feature a TV, hair dryer, coffee maker, microwave, refrigerator and USB and AC outlets. Sign up today for our Choice Privileges program and enjoy rewards when you stay at our hotels. Some amenities may requie an additional cost. In order to maintain our facilitys smoke and pet free environment a 100.00 deposit is required, in addition to room and tax charges at check in. Pets are not accepted. Service dogs are always welcome.